By late 1987, it had been proposed that Willesden would be the main yard at which marshalling of Channel Tunnel freight trains would take place. Customs clearance for such loads would also be undertaken here, in addition to using an alternative ‘’check-in’’ facility proposed at Ashford. Concern had been raised on the issue of centralising all freight on Willesden, for it reduced flexibility and ensured train despatches would be delayed. For instance, freight from Crewe would first have to stop off at Willesden for customs clearance, before proceeding onto the tunnel portal. Another, more desirable option, was to marshal and give clearance to freights at their originating point. 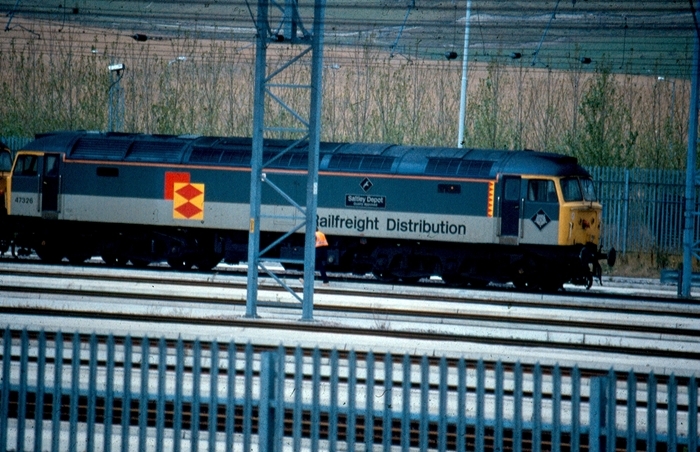 Railfreight Distribution came on the scene on 10th October 1988, after the merger of SpeedLink and Freightliner, and in 1989 the Business Sector decided to opt for the latter strategy. Despite taking these measures to allow freight an uninterrupted passage across the country and to the tunnel portal, there was one stop which trains could not avoid: that at Dollands Moor. 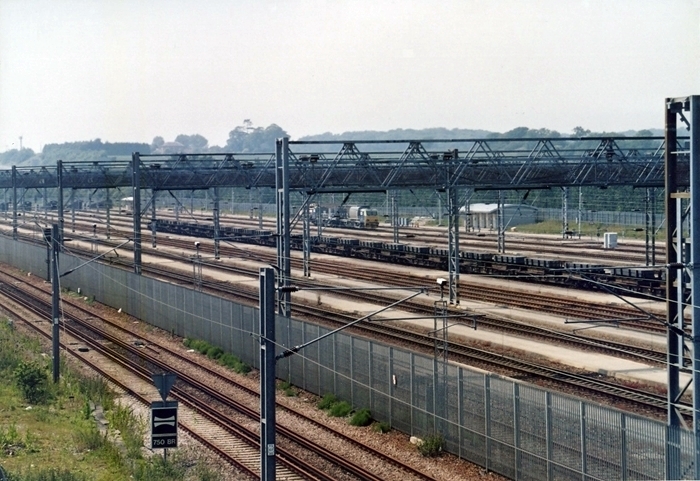 Dollands Moor had been part of the Channel Tunnel plan since the British and French governments ratified the ''Fixed Link Treaty'' in Canterbury on 29th July 1987. The yard formed an operational security requirement of Chunnel freight, where final safety inspections could be undertaken before formations embarked on their journey to the continent; hence, it is officially known as a ‘’freight inspection facility’’. Construction on this mass of electrified lines began in January 1988, some two miles west of the tunnel portal. From start to finish, the complex was 0.9 miles long and when completed, comprised ten loop sidings (and one bypass line) capable of accommodating formations half a mile in length. Predictions concerning the level of Chunnel freight traffic suggested that the capacity of Dollands Moor yard alone would not be enough, thus additional sidings at Ashford were to be used for freight inspection, too. Whilst existing primarily for safety checking, the yard was also to be used as an exchange point between diesel and electric motive power. To check that the overhead wires were functioning correctly, Class 86 No. 86208 ''City of Chester'' was brought to the site on 24th April 1992, Class 47 No. 47973 having hauled it across the South Eastern Division from Willesden. With the commencement of Eurostar services through the Channel Tunnel on 14th November 1994, a noticeable flaw in the track design came to light. This centred on ‘’Continental Junction’’, which was positioned at the eastern end of Dollands Moor and was the point of convergence for the Chunnel line, the domestic Kent Coast route, and the freight yard. Eurostar services were, at times, subject to delays caused by freights exiting the yard and incoming Kent Coast services. Consequently, in 2002, it was decided to move the junction approximately ¾ mile westwards. This was to allow the re-alignment of the Kent Coast line in order to accommodate the newly elevated track bed of the Channel Tunnel Rail Link. The latter came into use on 28th September 2003, offering shorter journey times. 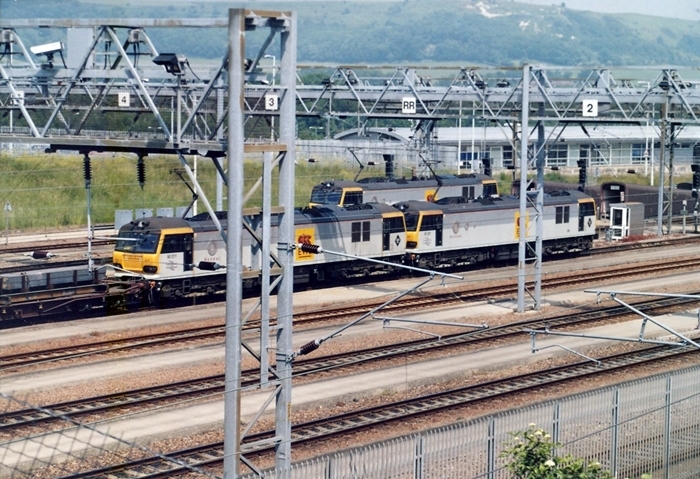 EWS operated the freight inspection yard at Dollands Moor from November 1997, having bought out Railfreight Distribution on the 22nd of that month. Ten years later, this company was taken over by "Deutsche Bahn". Return to the Kent Rail Homepage or alternatively, check for Updates.